Stores reference 22c/879, size 3 (71/8- 7 3/8). The leather is in very good overall condition, completely supple and quite clean. There is a very small seam split at the forehead (see photograph), otherwise minor scuffing, nicks and wear only. Embossed with war department broad arrow and stores reference details. All goggle straps are good and retain most of the original coating on the press studs. Soft verdigris deposits evident on some metal parts - these are quite easily removed with methylated spirit. The lining is lovely and clean. There is a minor split at the nape of the neck and the velvet forehead panel has some missing stitches. The right rubber receiver carrier is a little stiff but essentially good but the other has some cracks and deformation. The chinstrap is soiled and faded with little elasticity remaining. Fully wired with a pink flecked dark tan coloured loom, type 16 (10A/12443) receivers and black cased bell jackplug. Note that the leather loom retaining tag at the back of the helmet is present but not stitched into place. 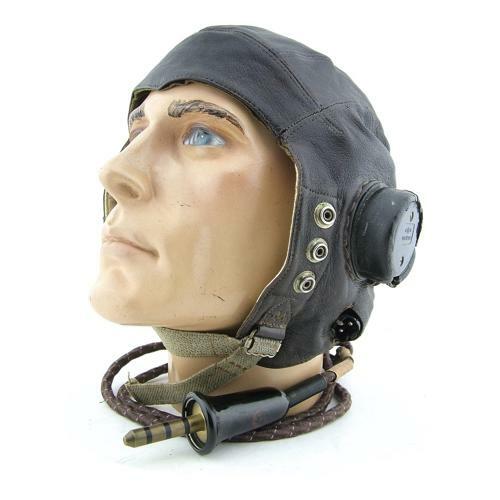 This is an early internally wired pattern helmet of definite wartime manufacture. It is let down by the one damaged receiver carrier but remains a reasonable used example. Stock code H22374.